Because I am in love with anything Tiramisu flavored! I have big Tiramisu plans for the future! Stay tuned! These macarons lit a Tiramisu fire inside of me! I want to eat everything Tiramisu! It’s probably my top favorite Italian Dessert (sorry, Cannoli!). Maybe I can make a Tiramisu Cannoli! What a great idea you just gave me! In any case, here is a recipe inspired by this amazing dessert! 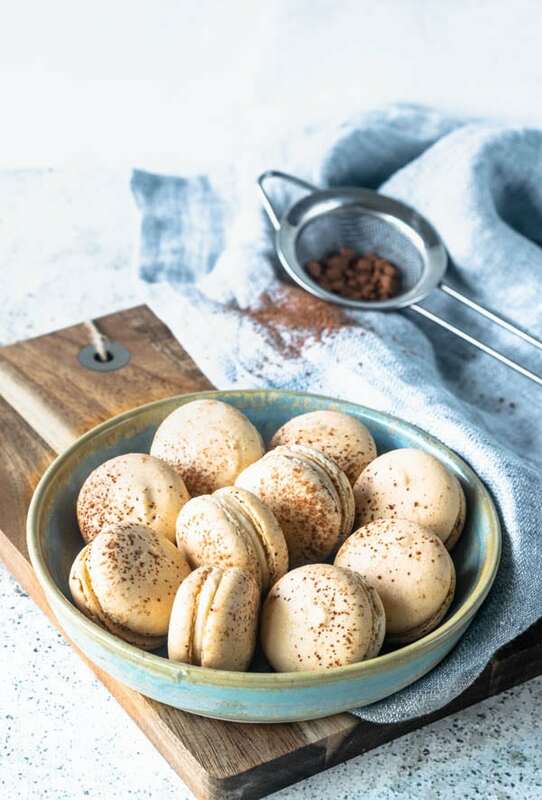 The shells of these Tiramisu Macarons have a slight espresso flavor. The filling is a light and fluffy Mascarpone frosting, spiked with Kahlua. And on top, we dust some cocoa powder, you know, classic! These indulgent bites are probably exactly what you need on the side of your coffee! If you are intimidated about making macarons, just know that it’s a matter of practice. You are going to have to learn how the batter is supposed to look and feel like. A lot of resources out there on the internet, and I even wrote an extensive post about the techniques I use to make macarons, you can check it out here. Just like anything in life, I repeat, it’s a matter of practice. Practice is the mother of perfection! So get practicing. 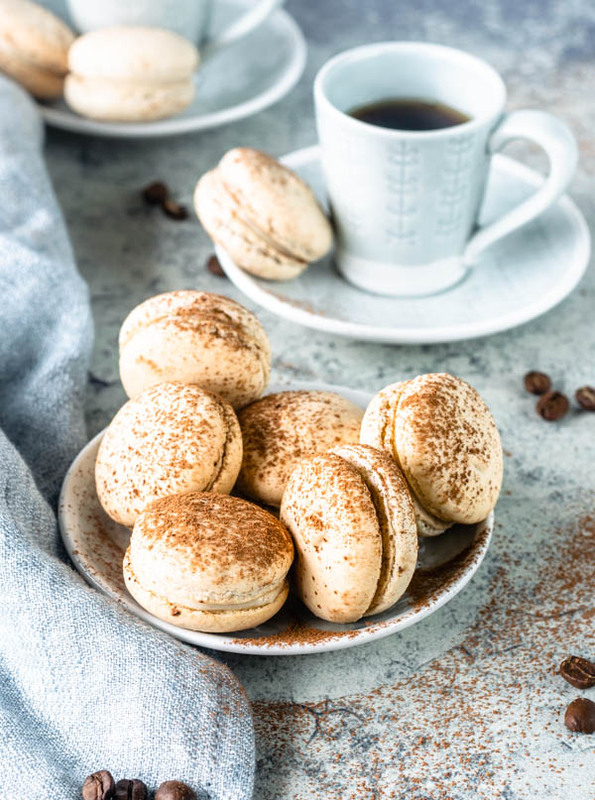 I like to enjoy these delicious Tiramisu Macarons with a cup of coffee! Want to join? 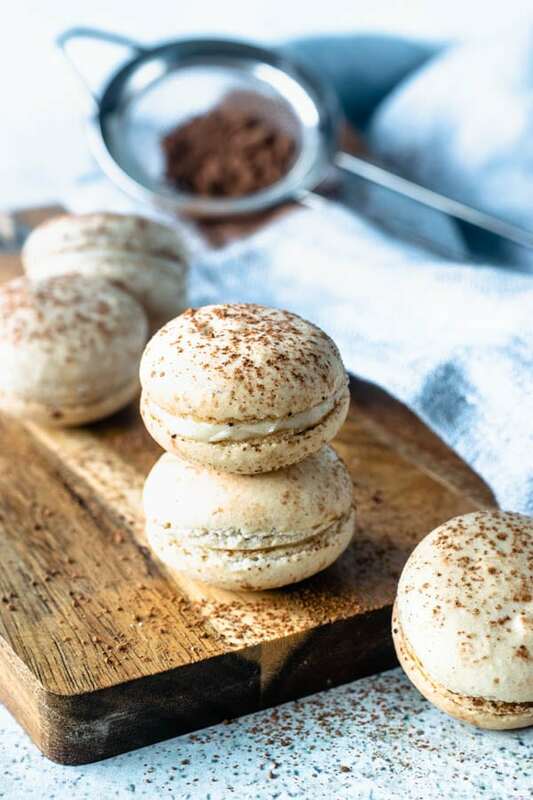 Tiramisu Macarons because I can’t get enough of this Italian dessert flavor! 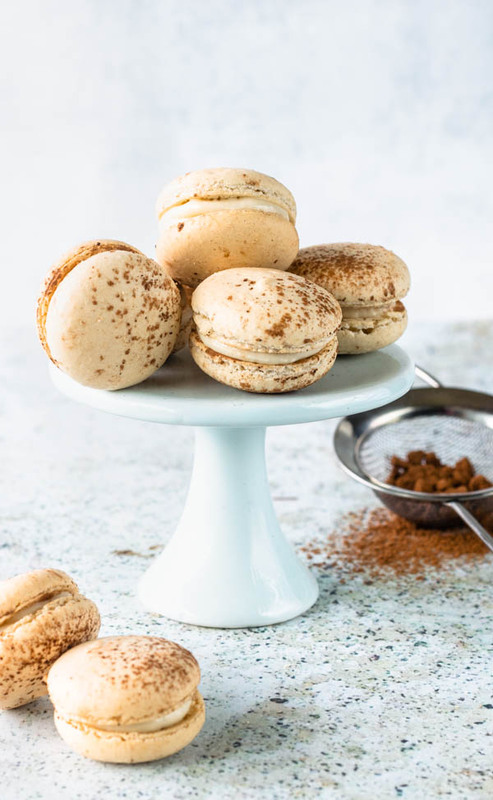 The Tiramisu Macaron shells have a light espresso flavor, then they are filled with a sweet mascarpone boozy filling, and finally dusted cocoa powder on top. Sift powdered sugar, almond flour and espresso powder together. While macarons cool down, you can make the filling. Start by mixing the sifted powdered sugar and mascarpone cheese together with a spatula. Mix until completely incorporated. Whip cream and Kahlua with an electric mixer, at high speed for about 2 minutes until stiff peaks form. Don't overwhip. Fold whipped cream and mascarpone frosting together. Put filling in prepared piping bag. Pipe a dollop in each macaron and close the sandwich. You are looking for the proportions of 2:1 cookie:filling. Wow! Simply amazing!! We are a tiramisu and a macaron fan family! You have done a brilliant job with the details of the recipe. Thank you so much, Sonal! I appreciate it! Your photos are always stunning! So down for the Tiramisu Cannoli! Awe thank you Tilly! I appreciate it! They look amazing, I love coffee flavoured anything so these are the perfect dessert snack for me, lovely! 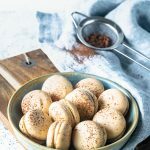 I too love coffee flavored anything so these Tiramisu Macarons were perfect! Thank you! What a delicious idea for a macaron recipe. These look like the perfect little treats. Thank you Jemma! I appreciate your support! I am also in love with anything that’s tiramisu flavoured! But tiramisu and macarons sound heavenly!! Two of my favorite things in the world combined!! 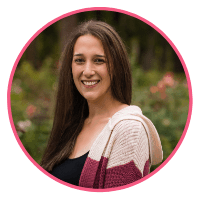 I’m so excited about these… Pinned!! Oh how scrumptious! These look amazing! I always wanted to try making these. These are so perfect I love how they all look so uniform, I have never tried them but you have inspired me to do so! Do give them a try! Might take some practice, but it’s fun! You made two awesome things – tiramisu and macarons – and made them even better. These look amazing. 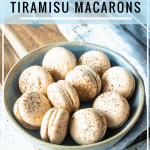 Tiramisu is my ultimate favourite dessert which means these macarons are right up my alley! What a wonderful way to combine both desserts. I love the sound of that mascarpone filling. I’m swooning! Thank you for the recipe, what a great idea. I made two batches of the macaron shell. The filling is what leaves me leaving a little lower rating. I have tons of it left with the shells being generously filled. I read and re-read the ingredients amounts to be sure that I didn’t put the wrong amounts. I think it’s too much whipping cream. The filling ends up tasting and texture of whipped cream, just a tad thicker. It’s rich and tasty but I would like for it to be thicker. I looked at a good tiramisu recipe and the amount of mascarpone was one pound to the same amount of whipping cream as this recipe. You’re absolutely right! It was supposed to be 1/4 cup and not 1 1/4 cup, it was a typo, and an overlooked mistake. I apologize about that! I will correct it!! Thank you!